We've launched a new mobile banking experience based upon your feedback. Faster loading times, cleaner navigation, and, as ever, total focus upon your security! View all your account balances in one go, including investments, deposits, credit card, and loans. Whether you need to schedule a stock trade for when the market opens or check if your time deposit matured to plan for next investment, just one tap gives you access to stock trading, foreign currency exchange, time deposits and certificate of deposit. FPS is here to make on-the-go payments simple, we’ve gone a step further to eliminate the pain of memorizing all your bill deadlines. One time, Scheduled or Autopay – you make the choice, we make the payment. One tap lets you view your points, latest credit card statement, access your bill and also helps you check the latest card rewards prepared especially for you. Get the lowdown on your card benefits and offers, while keeping track of your points and cash rebate balance - all in one place. Enjoy the option to convert your transactions or the latest statement balance (partially, or in full) into monthly installment plans. Pre-approval with instant confirmation, a few simple steps to get instant cash from your credit card. Bank safer with Citi Mobile Token and your face ID or fingerprint authentication. Receive real time security alerts anytime, anywhere. 1. How can I get the Citi Mobile App? 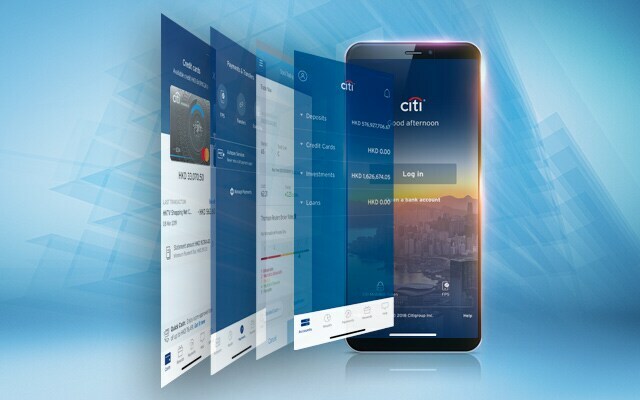 Currently Citi Mobile App is available in the following 16 markets: Hong Kong, China, India, Indonesia, Japan, Korea, Malaysia, Philippines, Singapore, Thailand, Taiwan, Vietnam, Australia, United Arab Emirates, United Kingdom and USA. You can get our app in Apple App store or Google Play store in these markets by searching "Citibank HK". 2. Why am I not able to use Citi Mobile App on my Android™ mobile device? If you want to use the latest Citi Mobile App on Android™ mobile device, you will need to grant the permission "Make and Mange Phone Calls" to Citi Mobile App. Please be assured that notwithstanding these permissions, Citi will not make or manage any phone calls on your behalf. 3. Why am I not able to use Citi Mobile App on my tablet? 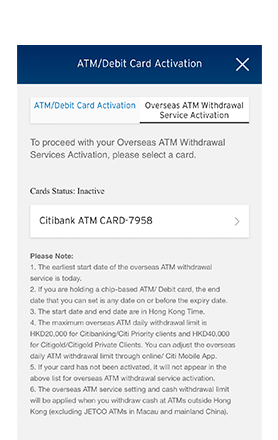 Citi Mobile App currently supports iPhone iOS 9.0 or above and mobile phones with Android 4.4 or above. We strongly recommend you not to use any mobile phone or tablet with non-compatible operation system. 1. Why is it not necessary/required to input a User ID? Why does the 'User ID' field disappear? To enable you to log on faster, we have eliminated the step of User ID input. Once you have logged on to the app with a User ID, your mobile device will be linked to this User ID. From then onwards, you are only required to input your password to log on. Each mobile device can only be linked to one User ID. 2. I have to use different User IDs to log on in order to manage my personal and company accounts. Why can't I input other user ID? To enable you to log on faster, your mobile device will be linked to a User ID that you log on with most recently. From then onwards, you are only required to input your password to log on. 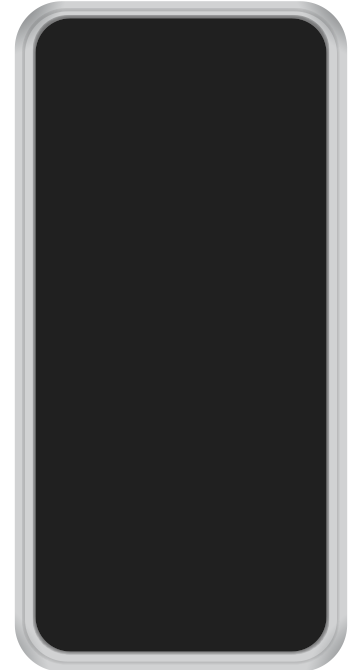 Since each mobile device can only be linked to one User ID, please use another mobile device or desktop/laptop computer to manage other accounts. If you want to log on with another User ID in the same mobile device, please tap 'Forgot Password?' > Input ATM card number & PIN of this account. Upon successful authentication of a One-Time Password, you can input a password of this account to log on. 3. 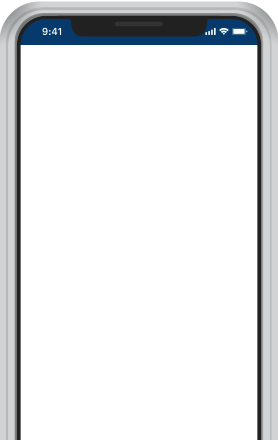 Why does an icon of Face ID/Touch ID/Fingerprint disappear? 4. I have input a correct password. Why can't I log on/Why does logon fail? We recommend you to reset your password to ensure that is a correct or a valid password to log on. To reset your password, simply tap 'Forgot password'. 5. I have already reset my password and input a correct one. Why can't I log on/Why does logon fail? Your user ID may be temporarily suspended. Please call our CitiPhone banking for assistance. 1. I received my credit card, how do I activate it on the Citi Mobile® App? In the new experience, look for the "Activate now" button on the image of your new credit card. Tap on it to activate the card. You can also activate the card from Settings . 2. How do I view my credit card transactions? Choose your card by swiping left or right. Swipe up for full transaction details. You can also search for transactions using on the top right corner. 3. What does the blue calendar icon next to the transactions on my card mean? The blue calendar icon means the transaction can be converted to a monthly installment plan. 4. How do I view my credit card statement? Choose your card by swiping left or right. Click on the "Statements" tab, swipe up and select "View billed transaction" for full statement details. You can also view or download a pdf version of your statement by tapping on "PDF" button on the top right corner of your screen. 5. How do I make a payment to my card? Tap and select "Pay to card". This option is available to customers with Citi checking or savings accounts. Follow the steps on the screen to complete your card payment. 6. How do I pay a bill using my Citi credit card? Tap and select "Pay a bill". Follow the steps on the screen to complete your bill payment. The screens and information displayed are for illustration purpose only. 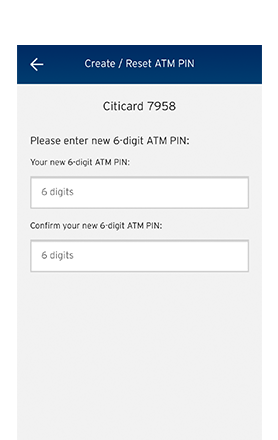 Please refer to the Citi Mobile® App for actual screens.